The Journal invited AFSA members to share their perspectives on this important topic. We asked five questions to spur discussion: What is the state of State Department political and economic reporting today? Can you provide recent (unclassified) examples of how reporting affected policy or led to a change in operations? What is the impact of the vast and instantaneous flow of information in today’s digital age on political and economic reporting (and are embassy reporting methods changing as a result)? What impediments to reporting—technological, physical access or process—have you encountered, and what would be your proposed remedy? Do today’s promotion boards give too much or too little weight to reporting and analysis versus other skills (e.g., management of people and resources)? Here is a selection of the responses we received. We thank all those who responded. I’ve often thought about this analogy as I reflect on my work as a political officer. The very term “reporting officer”—a favorite State Department catch-all—implies that a political or economic officer’s primary job is to report on conditions in the host country to inform and influence the making of U.S. foreign policy. But isn’t influencing host-country policy just as important to U.S. interests, if not more so? As a junior officer in Shanghai, I was routinely tasked with writing quarterly cables on the local macroeconomic situation. Even if anyone read them (something I doubted), I knew someone in Washington could have written them just as easily as I did from China. Almost all the data was on the Internet, and much of it was in English. The fetishization of reporting at many posts has led to an odd phenomenon. Even as overseas posts are reporting more than ever—not just by cable, but by email, both official and personal—Washington’s attention span is getting shorter. Many desk officers could spend all day doing nothing but reading (or just skimming) all the cables and emails and press summaries and Ops Center briefs and daily activity reports that pop into their inboxes. “Inbox management” has become as critical a skill in Washington as drafting a briefing memo, much less running an office. One of the hidden benefits of serving in Washington is seeing how field reports that get into the right hands can improve policy and operations. The department is drowning in information. But how much reporting actually gets read? How much ever reaches bureau front offices—not to mention the seventh floor? And if it doesn’t get read, how can it influence policy? We need to get back to basics. State should review the role of political officers in the Foreign Service, to help us refocus our work and set expectations. (We might start by looking at the recent emphasis on “economic statecraft,” and how it has revitalized the work of economic officers.) Senior officers should mentor and train newer officers not just in cable drafting, but in how to identify and engage contacts, and how to elicit and synthesize information. We should focus less on producing quantity reporting about our host countries, and focus more on clear, concise reporting that helps Washington understand those countries. We need to help the department better manage all the information it receives—not just add another cable or email to someone’s inbox. Good reporting is vital to diplomacy. It provides a record for others to learn from our successes, and our failures. It can inform, advise and even influence the making of policy at the highest levels. But diplomacy is more than some kind of glorified journalism. We still have to go talk to people and influence them. We have to hit the damn ball. Since joining the Foreign Service in 2002, Christopher W. Bishop, a political officer, has served in Shanghai, Khartoum, Yokohama and Washington, D.C. In August, he will begin Chinese-language and area studies instruction in Taipei at the American Institute in Taiwan. Bureau of Conflict and Stabilization Operations, Washington, D.C.
Running at full speed on projects at our overseas posts, it’s not easy to break focus and find time to send reports back to Washington. But like the proverbial tree falling in the forest, an activity in the field needs to make some noise if you want anyone in Washington to know it struck the ground. Working in the Bureau of Conflict and Stabilization Operations has impressed on me how field reporting can promote the use of new tools to fight conflict and instability. 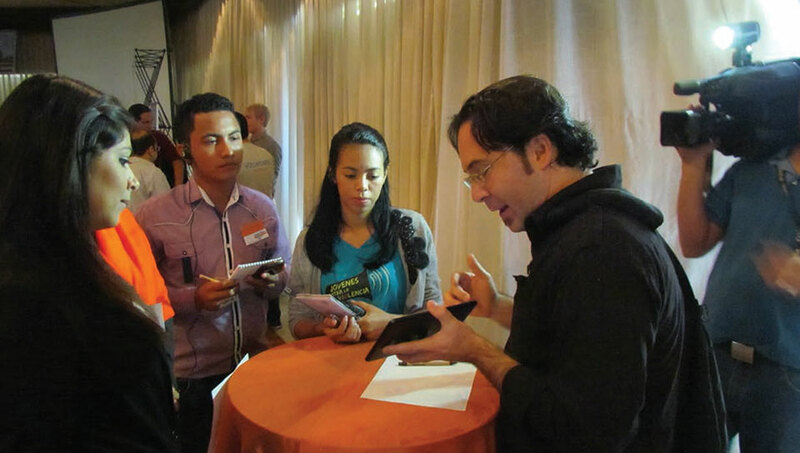 For example, our team in Honduras helped mount a conference with young technology-savvy participants, international funders and local government officials to identify tech-based solutions for addressing destabilizing violence in the country with the highest murder rate in the world. This event, called a “TechCamp,” was jointly organized by CSO, the Office of eDiplomacy and Embassy Tegucigalpa. It was a new experience for our bureau, but looked like an innovative way to address drivers of conflict. Field reporting painted an engaging picture of 13 groups proposing ideas involving digital platforms. Some, like coordinated social media strategies, were free. Others, such as a new computer-based crime-tracking system and a plan to allow anonymous incident reporting, won basic funding from an international nongovernmental organization. All of the proposals sprang from local groups using local expertise to find solutions to citizen security problems—meeting a central goal for the U.S. mission. Young, tech-savvy participants at a January TechCamp in Honduras discuss digital platforms to address crime and instability. Field reports on the TechCamp, including cables, email and even video clips, caught the attention of our bureau leadership and our Burma engagement team, which believed that a TechCamp would work there, too. That team adopted the basic elements of the Honduras event, and the Burma version, mounted in partnership with Embassy Rangoon and the Spirit of America foundation, was another success. We are now seeking opportunities to set up similar events in other countries facing ongoing conflict. Thanks in part to embassy reporting, the Honduras initiative is having even greater impact. As a Foreign Service officer moving between field and domestic assignments over the years, I’ve been at both ends of the reporting pipeline. I’m struck that one of the hidden benefits of serving in Washington is being on the receiving end, and seeing how and when field reports from our embassies and diplomatic posts that get into the right hands can improve policy and operations. With the right audience, making that noise can shape events and our work around the world. Since entering the Foreign Service in 1999 as a public diplomacy officer, Daniel Fennell has served in Iraq, Colombia, Venezuela, Mexico and Canada. In Iraq, he served as the spokesman and public diplomacy chief for a Provincial Reconstruction Team embedded with the U.S. First Infantry Division in an active combat zone. He is currently completing an assignment in the Bureau of Conflict and Stabilization Operations as the deputy director of an operations team, and will begin an assignment as the public affairs officer in Accra this summer. Being a reporting officer is interesting, rewarding and important work. I love the pursuit of knowledge and particularly enjoy searching out expert contacts on the subject I am responsible for covering, and learning from them. In the best of times we are afforded the luxury of writing think-pieces, which rely on multiple sources and offer depth and perspective. Spot reports and shorter writing pieces are by far the more common type of reporting, but even in those we strive to include the perspectives from people on the ground with whom we have talked. Why is all this important? I believe that, unlike journalists, reporting officers must be perpetually building our network of contacts. That way, when a crisis arises we are in the best possible position to draw on our relationships to positively affect the outcome. This impact is often focused on our best interests as Americans, but just as often promotes the best interests of the people of the country in which we are serving. It is in times of crisis that our network matters most. But that network is only as good as our reporting efforts have helped to make it. There may be only a few times in our careers when it all comes together, but when it does, it makes a huge difference. That happened to me in Malawi in April 2012, when the sudden death of President Bingu Wa Mutharika led to a two-day period of uncertainty during which an unconstitutional transition of power—a coup—almost occurred. Unlike journalists, reporting officers must be perpetually building our network of contacts. Through Ambassador Jeanine Jackson’s immediate engagement, we were able to encourage the constitutional transition of power to Vice President Joyce Banda. Our network of reporting contacts made this engagement flow naturally. In May 2014, President Banda competed in an election against Bingu Wa Mutharika’s brother, Peter Mutharika, and lost. Although vote counting was a protracted process, Banda acknowledged her defeat, and the rule of law has prevailed. Here is another example, from our consulate general in Basrah, where I recently completed a year of service as energy officer. One of our highest priorities is keeping Washington abreast of developments in southern Iraq’s energy sector, where exports of more than 2.5 million barrels of oil per day account for 90 percent of the country’s total oil production and the vast majority of its national budget. Having built a wide-ranging network of active contacts in the energy sector, I was able to influence stakeholders both in and out of government. Our most recent analysis of southern Iraq’s oil sector summarized an entire year’s worth of field visits and data collection into a succinct argument for Iraq’s need to hire an outside project management firm to meet its ambitious oil expansion plans. That reporting directly contributed to our leadership’s ability to craft a set of policy recommendations to help stabilize Iraq’s economy and simultaneously ensure a less volatile world market for oil. Since joining the Foreign Service in 2005, Christopher Markley Nyce has served as an economic officer in London, Managua and Lilongwe. To get the United States out of a deep recession, the Obama administration used many tools when it took office in 2009. It was a time of high unemployment and despair, of bailouts and stimulus packages. It was a time for the National Export Initiative and international trade to be added to the policy toolbox. And it was a time when trade agreements were awaiting congressional ratification, involving the three amigos: South Korea, Colombia and Panama. Economic and political reporting, without a doubt, advanced the cause of ratifying those pacts, which now benefit businesses large and small and people in many countries beyond the four signatories. In July 2010, I arrived in Bogota as the new trade officer. I had the good fortune to be at the right place at the right time. We wanted to do all we could do to persuade Congress to ratify the trade agreement between Colombia and the United States. But what could we do? 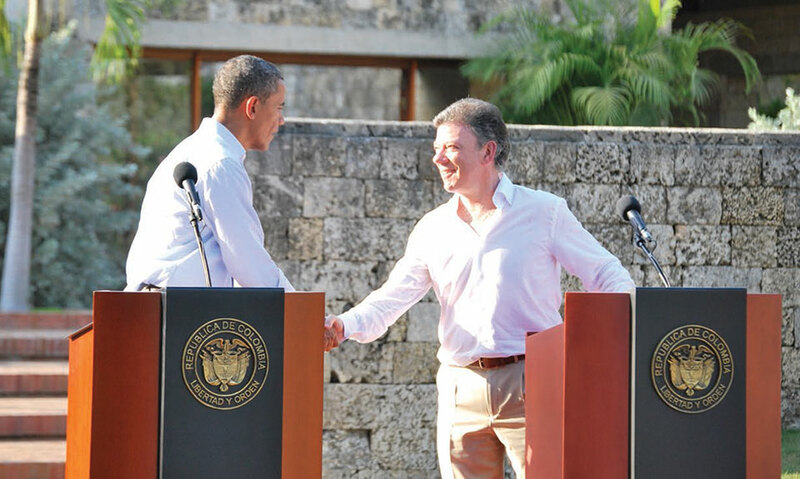 U.S. President Barack Obama and Colombian President Juan Manuel Santos shake hands after a bilateral meeting at the margins of the Summit of the Americas in April 2012 in Cartagena, where they announced the Free Trade Agreement’s date of entry into force. Among other things, we reported on the billion-dollar market share U.S. agriculture was losing to countries that had free trade agreements in place with Colombia. We monitored trade negotiations between Colombia and major competitors including South Korea, the European Union and China. We also documented trade agreements as they entered into force. And we painted a picture of Bogota’s aggressive trade agenda and the economic losses to U.S. exporters if the trade agreement was not ratified. Similar reports went in from South Korea and Panama, but each of the three amigos had its own peculiarities. For Colombia, the special twist was labor and the labor action plan, and what a twist it was! We had some superb labor officers—that rare breed that pingpongs between political and economic sections, depending on the roundness of the ball and the size of the racket that hits it. Their impartial reporting was critical to the cause, covering reactions from the labor sector and events leading to the labor action plan. Once the plan was in place, they reported on progress toward meeting the plan’s targets and continued to report on labor sector positions. These virtuosos had to convey accurate information to change the old preconceptions about the labor sector in Colombia and present an updated reality of the country to justify ratification of the trade agreement. There are far more details and stories about the three amigos, and perhaps one day they will be written down. If you ever find yourself, as a reporting officer, wondering whether the cable you just drafted and put through the transformation of the clearance process would affect policy, just remember the three amigos: the South Korea, Colombia and Panama trade agreements. Political and economic reporting does make a difference. Ivan Rios is an economic and commercial affairs officer now serving in Windhoek. He joined the Foreign Service in 2005 and has served in Mexico City, Recife and Bogota. Prior to that, he held two limited non-career appointments, in Mexico City and São Paulo. The world has changed in the three decades since Mongolian Airlines stewardesses in black fishnet stockings crossed my desk in Washington via a cable from the field. That cable described a bipolar world, stark and clear, where the gulf between what “we” saw and what “they” saw was so great that the contrast yielded the deliciously absurd. In that world, State Department cables translated faraway events, large and small, obscure and evident, into understanding. Narration, local color, interpretation, analysis—the tools of the magazine writer, of William Shawn’s New Yorker—produced both excellence and excess. Now that world is gone, and those tools have fallen into disuse. 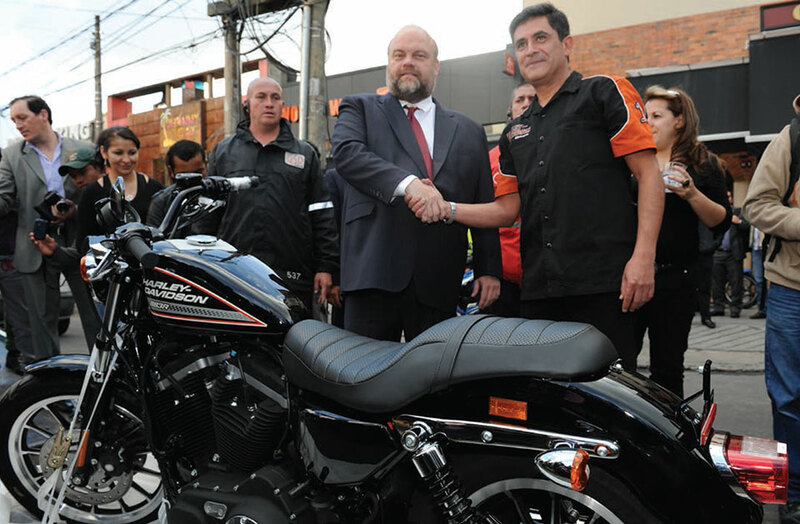 Embassy Bogota Deputy Chief of Mission Perry Holloway, center, during a ceremony celebrating the arrival of the first U.S. motorcycle, a Harley Davidson, imported into Colombia under the Free Trade Agreement signed in 2012. For better or worse, the Cold War world offered my colleague Kathryn and other American diplomats a natural narrative framework. They wrote to connect local events to the global narrative, and to show how they diverged, offering insights the D.C. desk jockeys could not. There is no clear picture window on the multipolar world we face as new diplomats. If today’s cables sometimes lack context and interpretation, perhaps that is because today’s world is more complex, America’s role is harder to define—and crafting big-picture analysis feels like hubris. But if by oversimplifying we risk misinterpreting; by confronting complexity without analysis, we beget misunderstanding. Perhaps this call also hints at how State Department reporting sometimes comes up short, and how we can fix it. Reading a recent cable on a tiny country’s coming election, I found an unimpeachable primer on the rules of the race, but no hint of how the election might matter beyond those borders. In today’s interconnected world, surely it would. As Foreign Service officers, our job is to explain why. We could do with more, and more innovative, training in writing. We could do with less make-work and a streamlined process for mandatory annual reports. But we could also do with a little less modesty. We are America’s frontline foreign affairs professionals. Why not challenge ourselves to contribute to this new narrative? When we neglect the difficult discipline of regular writing—telling ourselves that cables don’t matter, that an email will do and that we should instead focus, relentlessly, on outreach and conference calls—we treat diplomacy like the kind of war that is won through action at any cost. We forget that writing is a tool for thinking, and that we will be better at our jobs if we better understand the challenges we are facing. The core of diplomacy is the belief that an exchange of ideas can change the world. As American diplomats, our job is not merely to note our own doings, or even new facts, but to draft cables that interpret and help steer events. It is to help shape the world, through the power of our ideas. Kathryn Hoffman is a political officer now serving as the deputy of the economic/political section of Consulate General São Paulo in Brazil. She has previously served in Port au Prince, Khartoum, Kabul, PRT Nuristan, Tel Aviv and Jerusalem, as well as in Washington, D.C. She joined the U.S. government in 1987 and the Foreign Service in 2003. Samuel C. Downing joined the Foreign Service in 2012 as a political officer. He is serving his first tour at Consulate General São Paulo. No, it hasn’t happened yet—but we are getting there. Instantaneous digital communication has created a paradox wherein our ability (and desire) to instantly transmit information has actually diminished our ability to process, understand and use that information. In the universe of political and economic reporting, this paradox has manifested itself in the call for “shorter” and “even shorter” cables. Admittedly, I have only been with the department for five years and I don’t know how things were back in the day, when everybody had to trudge uphill through the snow both ways just to pound out a cable on the single Wang machine in the office. But even in my short tenure, I have noticed that the trend in reporting has been toward shorter and shorter cables. Nobody has time to read the vast amount of material being produced. As writers, we spend inordinate amounts of time crafting the perfect summary paragraph because we know that is all that is likely to be read, if it is read at all. Just imagine if George Kennan sent his celebrated “Long Telegram” today. Instead of launching Kennan on a path of foreign policy fame, that cable would die an ignominious death by a thousand clicks of the delete button. We’ve all been there—on both sides. As consumers, much as we would like to read the latest cable on mud exports from Southern Elbonia, there are only so many hours in the day. As writers, we spend inordinate amounts of time crafting the perfect summary paragraph because we know that is all that is likely to be read, if it is read at all. Where is the logical endpoint? Even more disconcerting: with the ease of digital communications and access to open sources and social media, will reporting officers be tweeted out of a job? If the beast can be happily fed on 140 characters at a time, why are we spending millions of dollars to station officers overseas when their reporting won’t be read? Is there a magic formula for producing useful, quality material without being a burden on an already overloaded audience? Can we, as reporting officers, successfully communicate our product without resorting to top-10 lists with pictures of cats? As a concept, information overload has been around for a long time. Unfortunately for those of us in the Foreign Service, our capability of dealing with information is lagging far behind our ability to produce it. And things will only get worse. We need to find technological and organizational solutions to the issue other than creating a classified Twitter system. We need to train entry-level officers to focus on quality over quantity, and senior-level officers to have the self-discipline to delegate and, yes, put down that BlackBerry once in a while. All of us need to change the ways we process and use information—beyond asking for shorter cables. I would go on, but it appears I have already reached my word limit. Travis Coberly, an economic-cone officer, joined the Foreign Service in 2009. He has previously served in Merida and Hyderabad.